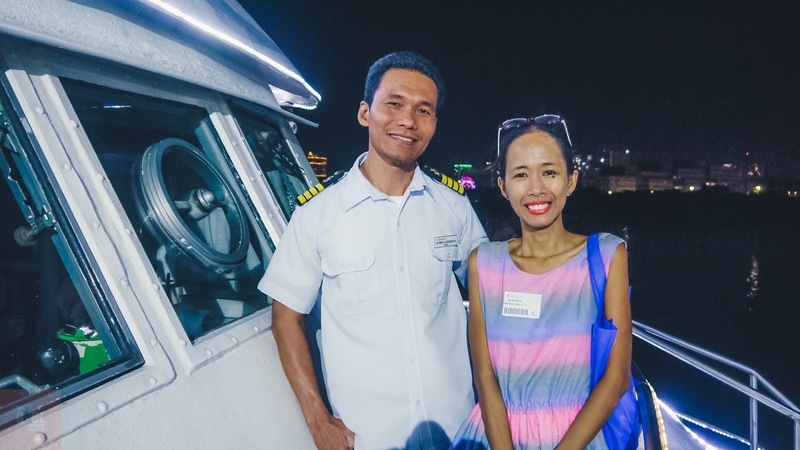 What may happen to you if you arrive later than 5PM at MRT/LRT Taft Station and you are taking the 6PM Manila Bay Dinner Cruise plus my experience, review of Sun Cruises, photos from the cruise, upcoming events, rates and all other information you need for booking a dinner cruise. 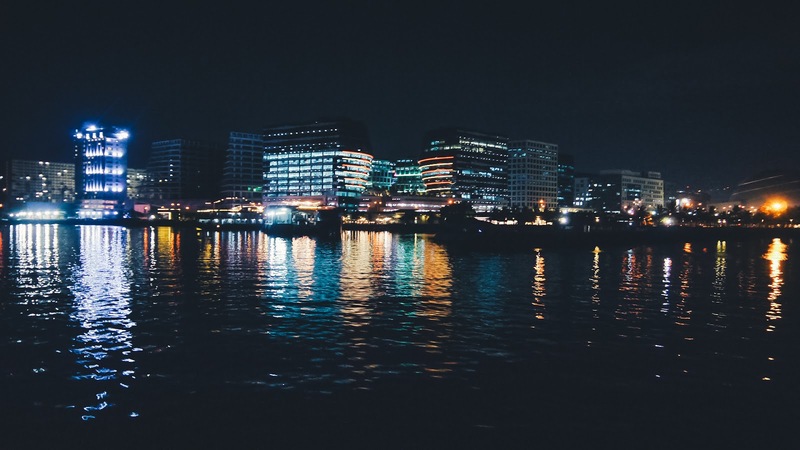 Manila Bay is a natural harbour in Manila that's been facilitating trade and commerce between the Philippines and its neighbouring countries. It also serves as a jumping-off point for Corregidor and other nearby islands ripe for adventure. A growing number of locals and tourists prefer to end a day of sightseeing or shopping around the area to catch a spectacular view of the sunset. 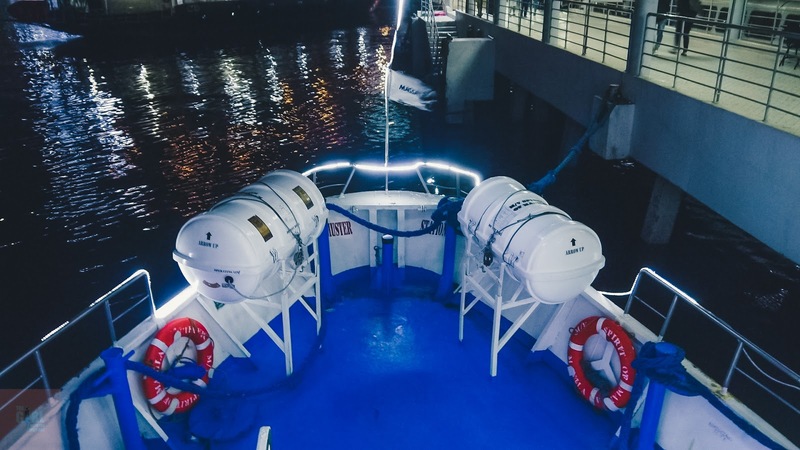 A unique way to do this is through the Manila Bay Dinner Cruise by Sun Cruises. 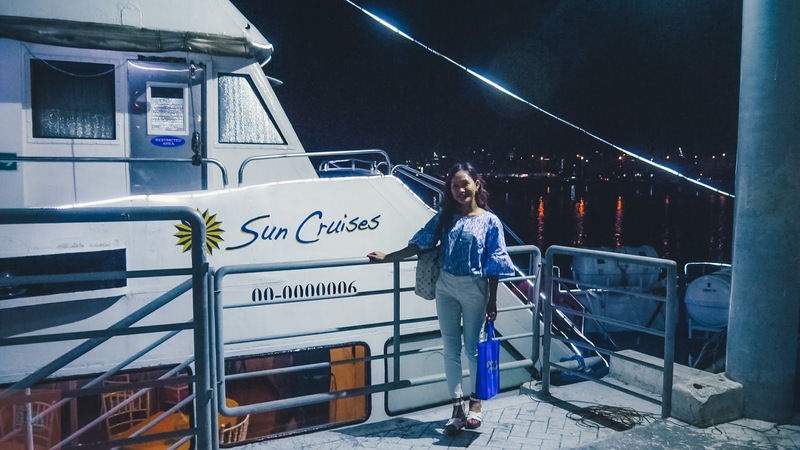 So, when I received the invite from Sun Cruises to experience a dinner cruise aboard the M/V Spirit of Manila, I was ecstatic... I was overjoyed on the day of the cruise... And a little late for boarding! The boarding time is at 5:30 PM. The ferry sails at 6 PM sharp. 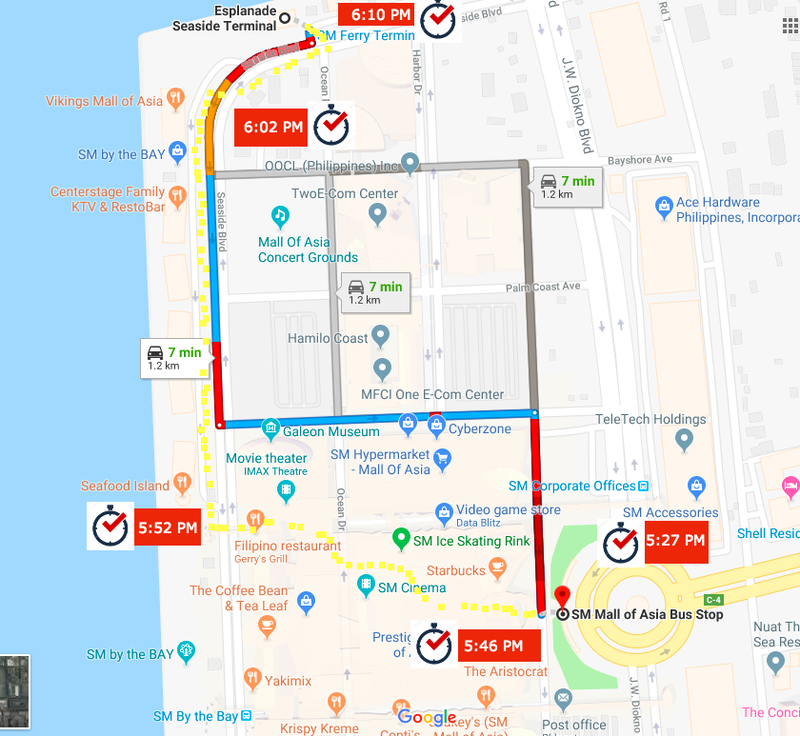 In my experience, it is better to arrive at 5 PM at the Esplanade Seaside Terminal so as to avoid getting stuck in traffic along EDSA going to SM MOA Global Rotonda. My first mistake was to arrive at MRT TAFT station at 5PM. I should've known better than anyone else never to brave EDSA during the rush hour... My second mistake was not reading carefully (or maybe understanding) the exact location of the ferry terminal. So this oversight led me to run 1.2 km in heels to make it to the sailing time. If I were a regular passenger, I wouldn't have been able to make it since cruisers need to check-in before the boarding time just like in any other ferry rides. Again, you should be at the Esplanade Seaside Terminal at around 5PM. Proceed to the Check-in counter, pay the cruise fee and a PHP 30 terminal fee. The staff will give you an identification sticker that should be placed on your chest all throughout the cruise. Do not lose this to avoid any problems. At 5:30 PM, prepare to board the ferry. Follow signs and staff members to board your Sun Cruise ferry right away. You may choose to settle in the lower deck of the ferry with chairs and tables close to the buffet station and also close to the restroom. But I recommend you stay on the upper deck for the best view and rather cooler experience. The live band is also on the upper deck serenading the guests during the one and a half hour cruise. 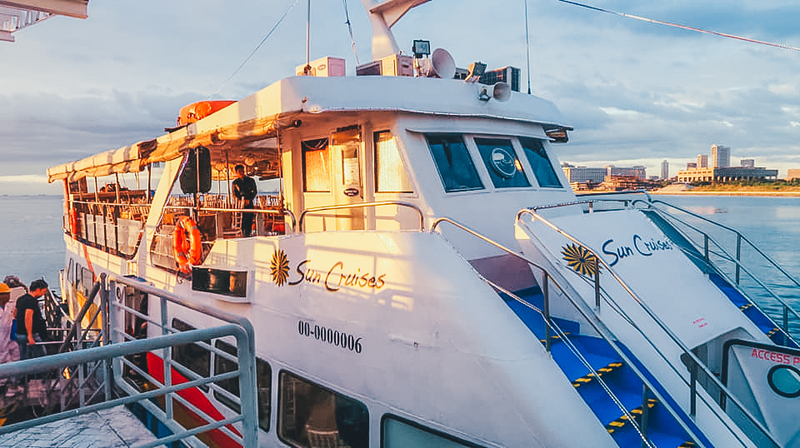 While waiting to sail, make the most of the golden hour and take photos with the Manila skyline as your backdrop. You can also enjoy the changing hues of the horizon with a cool drink on your hand as the sun slowly sets down. 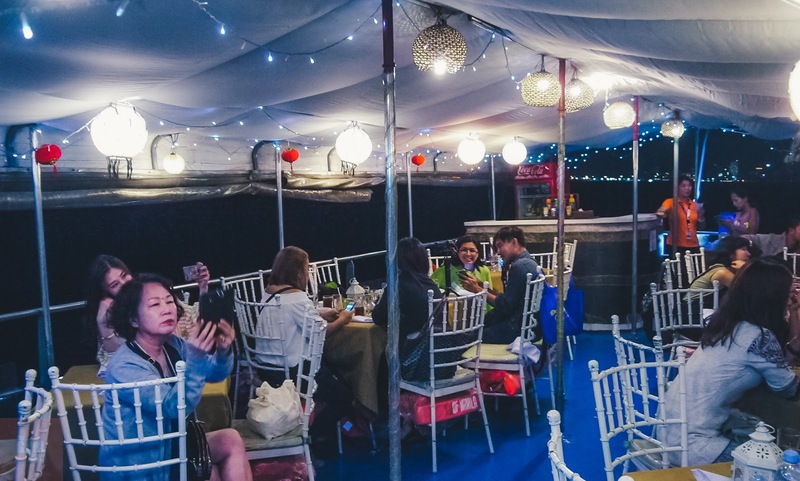 As soon as we started sailing, the ambience in the upper deck transformed. The music turned up. The lights became softer. I also felt it got cooler. Well, I was out of breath when I boarded so the breeze must have calmed me down. Although I am fond of blasting speed, I still appreciate a slow cruise. That said, I thought you'd wanna know the ferry moves very subtly. It's obviously unlike that speedboat I took in the Maldives wherein one passenger literally threw it all out because of its speed. 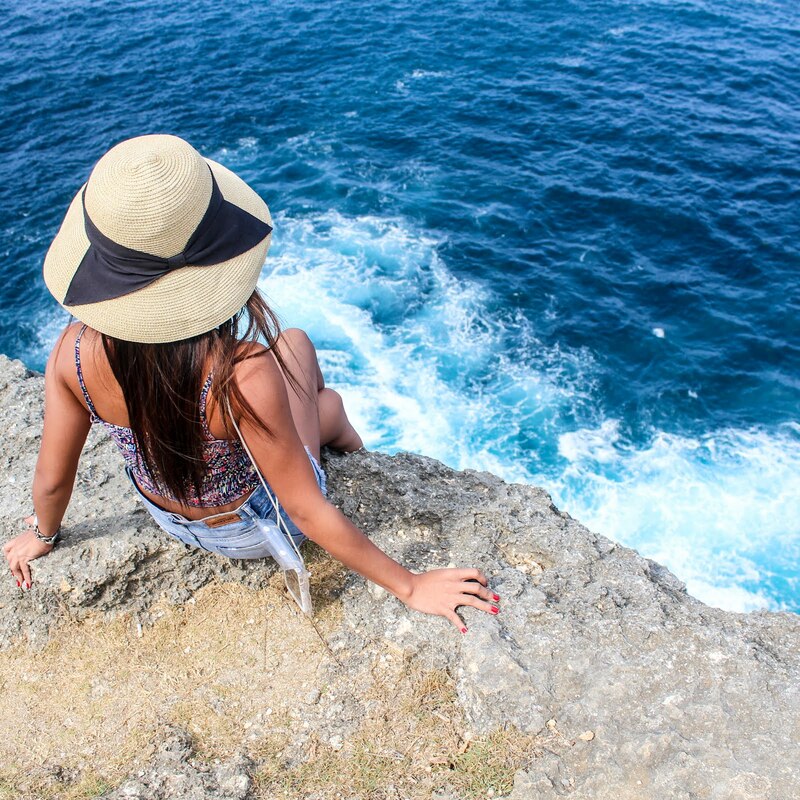 This cruise won't in any way make you feel seasick. 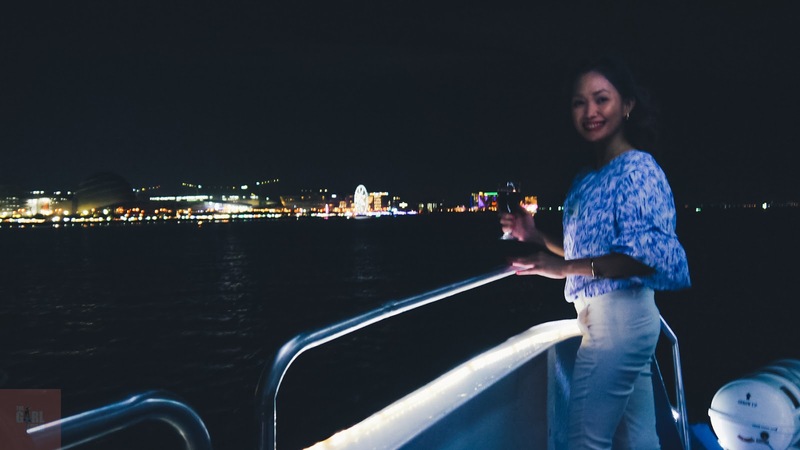 In fact, you can move around (even in high heels), take photos, grab your food from the lower deck, take a short trip to the comfort room, and back to your table no sweat. If in case you experience any difficulty moving around, the crew are all prepared to give a hand and assist you. Speaking of the staff, I must commend all the crew for being helpful, professional and courteous at all times. 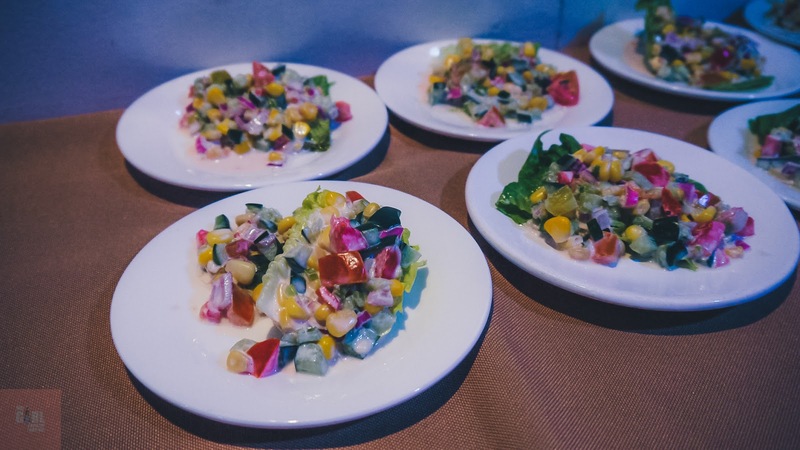 The dinner might not be gourmet, but decent courses were served. 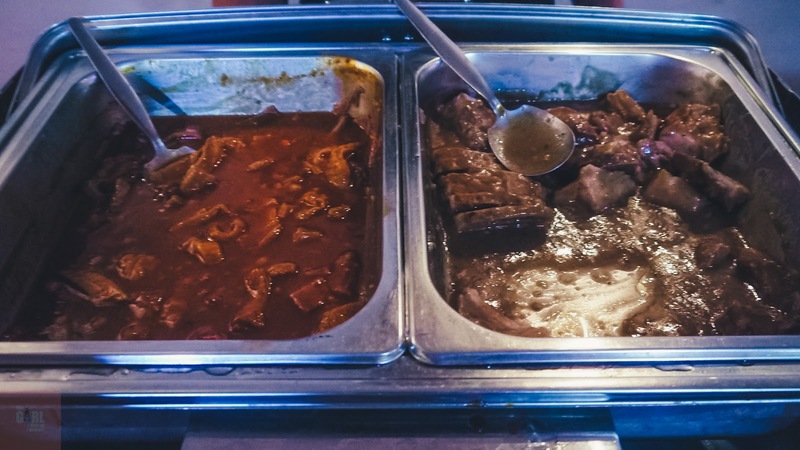 The selections during our cruise: fish fillet with zesty lime sauce, baked chicken with pepper sauce, callos, roast pork with balsamic glaze, local salad, onion soup, steamed rice, bread, cupcakes. 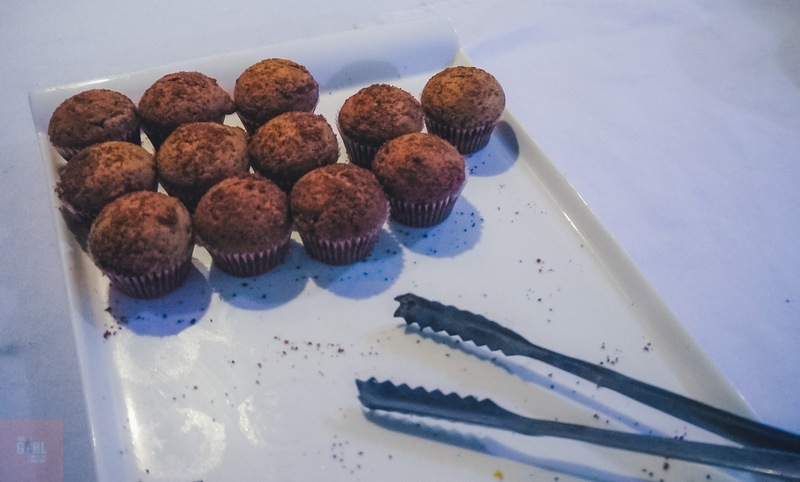 If you have a big appetite, you can eat as much as you want. In my case, I loved (and ate much of) the fish fillet, salad, and cupcakes. The drinks served were water and iced tea. You can request for soda in can or wine. I had a glass of red wine. While we were enjoying our dinner, the live band played acoustic hits. They also invited anyone who would like to join them singing or dancing. Some passengers danced. It was entertaining. 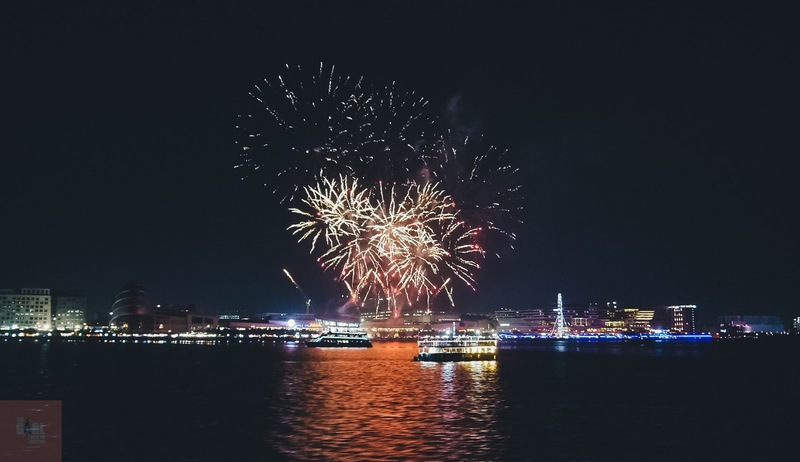 Sun Cruises has been working on improving their cruise over the past three years and until now they continue to make their facilities and services better for the satisfaction of their guests. And they are doing a great job! 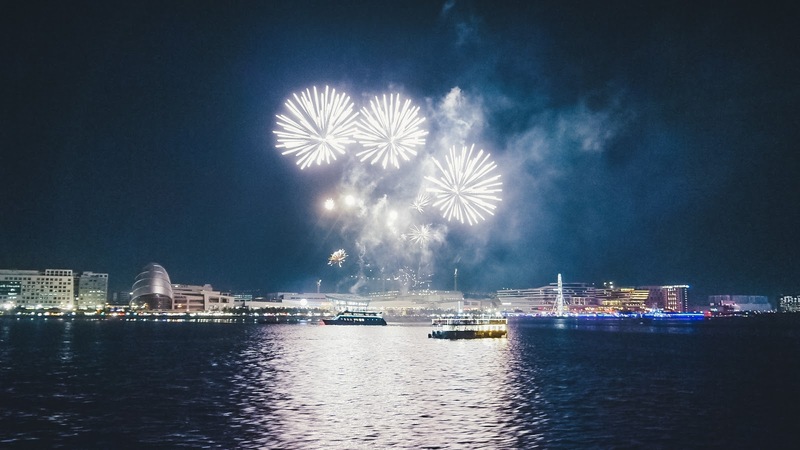 Before the fireworks display, I already thought the dinner, the ambience, and the view from the ferry were already amazing. But the fireworks happened!!! Wow! What a romantic way to start the love month!!! 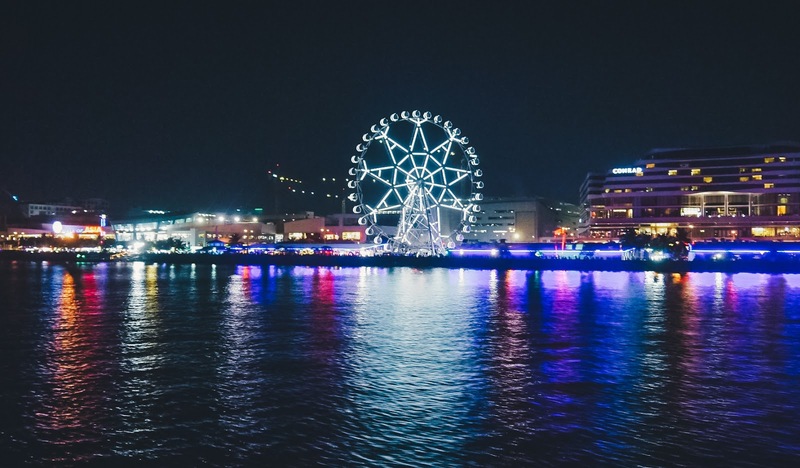 Esplanade Seaside Terminal is located at the Seaside Boulevard SM Mall of Asia (MOA) complex Pasay City, Philippines. If you are getting off MRT/LRT Taft Station, take a cab straight to the terminal. Had a great time aboard! 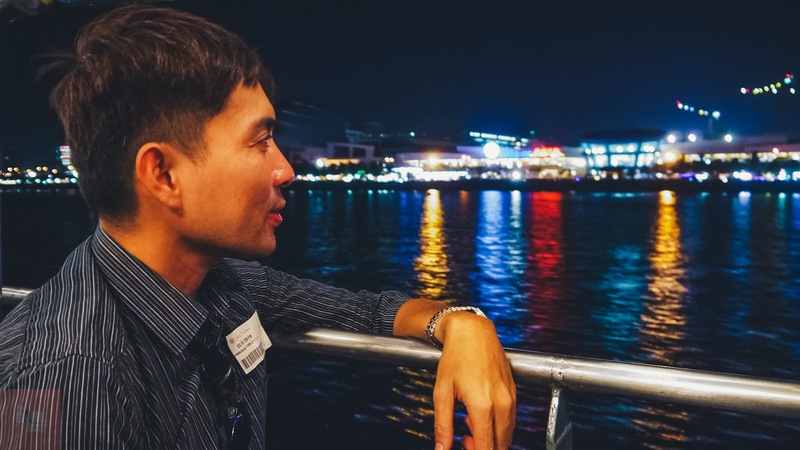 I recommend you try Manila Bay Dinner Cruise by Sun Cruises especially with your special someone! What a cruise I’ve just had! And what a run in heels before that! 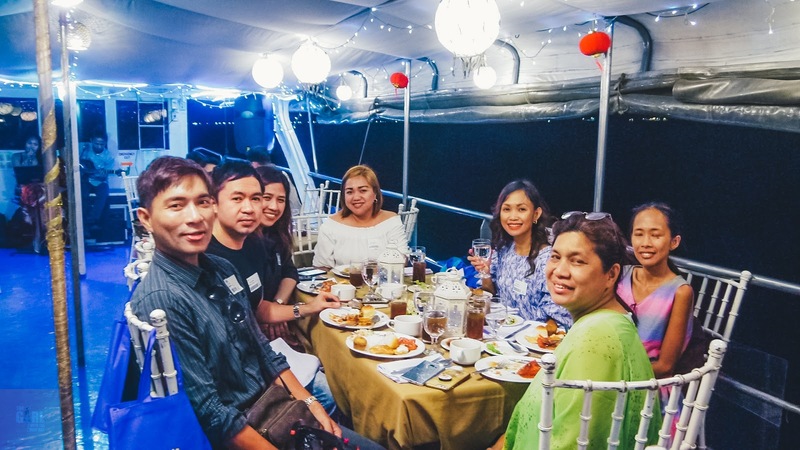 My experience has me agreeing the Manila Bay Dinner Cruise is indeed pleasant, safe, and so much fun; I'll do it again. But next time, I'll definitely take the cab! 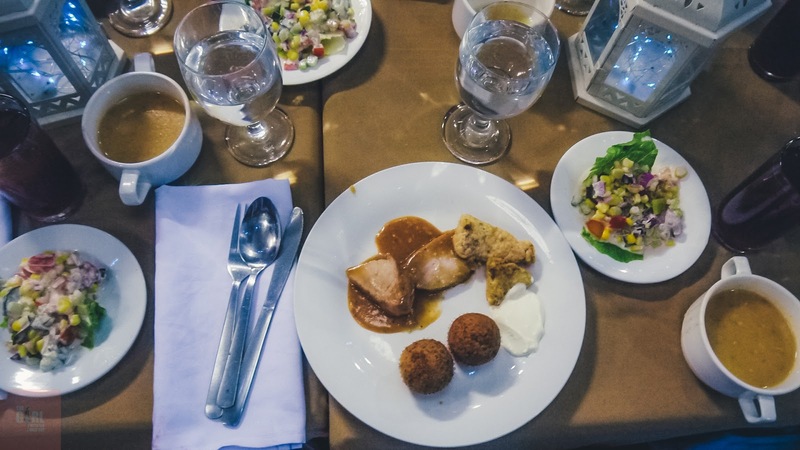 Have you ever been on a dinner cruise? 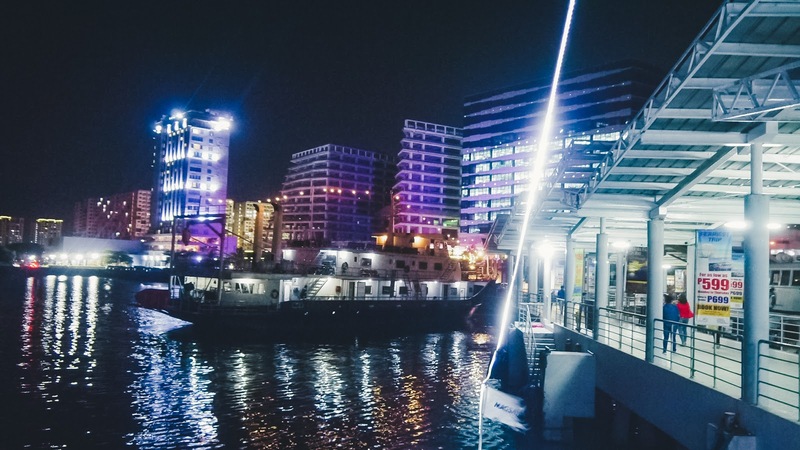 What do you think of the Manila Bay Dinner Cruise by Sun Cruises? Do you want to try it? Let me know your thoughts in the comments section below! If you know someone who'd be interested to try this, remember to share this post! Thank you!